Bad: Not challenging for all ages. Sometimes not much content. If there are two things that should calm you down in life, two things that should help you get to sleep, it must be similar fluffy shapes that sometimes make animal noises depending on if they walk on the ground or float in the air. Very similar to its precursor, Clouds & Sheep 2 is all about.. clouds and sheep. With the appeal of a mobile game, it’s also released on the Switch. Even though Clouds & Sheep 2 has a certain sandbox feel to it, it is limited by a story with story goals that provide you with the main objective to strive towards new lands and follow a wacky road set out for you. You will hunt a legendary treasure and go through landscapes that you didn’t previously see sheep in. This does not, however, actually really change any of the gameplay, nor does it add much of a real story. It’s comparable to other mobile games like, let’s say, Candy Crush, where you mainly involve yourself playing the game and finishing objectives, to get a small few lines of ”story” at the end of a world. This, and the lack of any other cutscenes or story setup, really makes it noticeable that this game was firstly designed for mobile phones. The graphics scream ”young kids, come click and play with me”. The target audience, though some more adult people might enjoy the game as well, would definitely be the little ones up to an age of about ten years old. In that range, it has something for everybody. The very cartoony graphics suggest the same, with animations like they come off a Sunday’s kids show. Which isn’t a bad thing at all! It means the graphics are actually high quality, pleasing to the eye, and very fitting for their demographic target. If anything, they are done well enough for everybody to be able to enjoy them. Not only are they crisp and smooth, but they also leave room for a bit of imagination such as buying silly hats for your sheep. 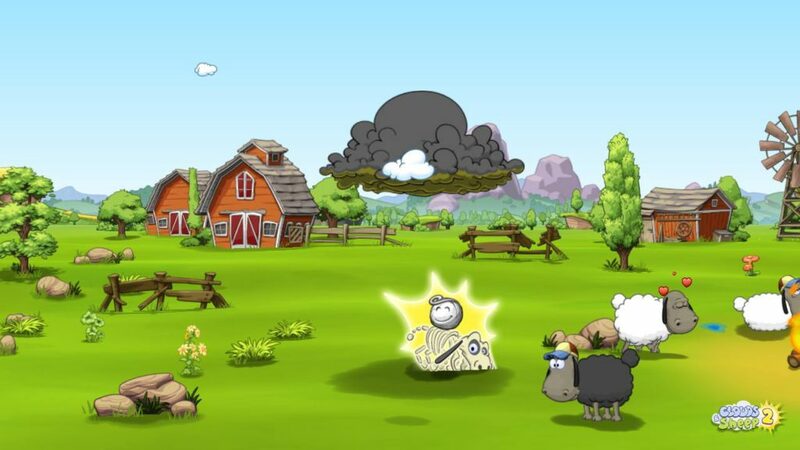 Clouds & Sheep 2 creates a space where you can carelessly play around in a colorful world. The sound design of Clouds & Sheep 2 really also falls into the same mixed area of the targeted young audience and a game initially developed for a mobile phone. When you ever played a match-3-or-more game on your phone, you might remember that when doing something correctly with a match, a multitude of sounds approaches you with violin strings, bleeps, bloops, glass sounds and whatever you can imagine. Clouds & Sheep 2 has a similar design approach where you also get these types of sounds when you complete an objective or do something well. Besides that, there are regular cartoon sounds as the sheep’s voices are basically narrated by people saying ”meh”, imitating several sheep sounds. Other than that, everything does have a sound, and to make that more apparent, the cheerful background music will sometimes hide itself to make the rest pop up more. There’s not much to say about the quality of the sound, except that it fits and you would expect as much of mobile games like these. 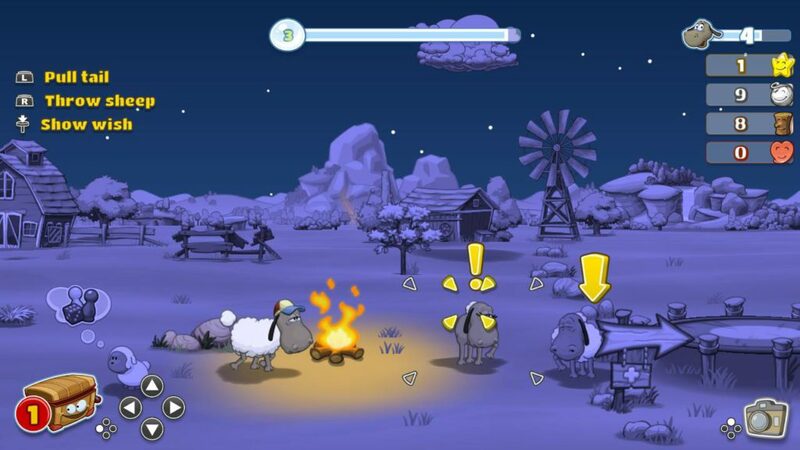 Clouds & Sheep 2 is a sandbox game where you can just have fun if you want to, but still has certain goals to achieve. These goals range from ”plant a tree” to ”find a legendary treasure” depending on whether you need to fill up your time and earn resources with repeating quests, or if you are able to do special (story) quests. 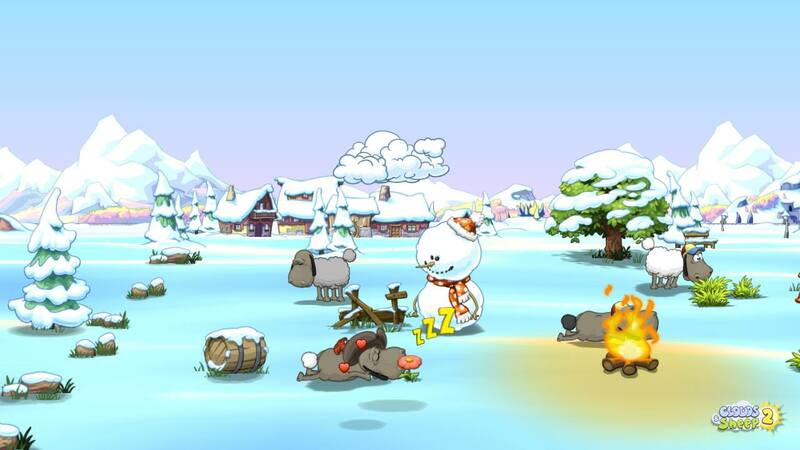 The game has a gameplay part and an esthetic part, meaning part of the things you can do will bring you growth in your game or for your sheep by allowing you to purchases usable items. The other part is defined by decorating each landscape you go through as you want, but this holds you back in getting to the main goals faster because of the resources you use. The game is not really challenging as well, and for a more mature audience, you will probably only like it if you are in a mindless mindset of laying back and tapping random things on your screen. From that perspective, the game’s biggest values are the graphics and the unexpected things you can discover as you play around with the sheep and the environment. The game is called Clouds & Sheep cause those are the main focus you will interact with. Sheep are able to be thrown into the air, rolled around and taken care off. Clouds are needed to provide rain to let things grow, or when you mix more clouds together you will get thunder that is able to destroy things. The game also shows a certain circle of life. If a sheep dies, it becomes a cloud, if a new sheep is born, it comes into existence from a cloud. Besides these two things, you will get trees, flowers, you need to shave your sheep to get wool et cetera. It’s not that much, but the curiosity of what’s next is enough to keep the gameplay a bit captivating. Combine that with the graphics, and for a younger audience, it isn’t half bad at all. When taking in mind that the game probably appeals mostly to a young audience, the conclusion and rating are also set up like that. Because for a more mature audience, even casual gamers, the game lacks challenges in gameplay and an overall purpose. For the younger ones, however, it can provide a good amount of fun of tapping, figuring out new stuff, and just overall entertainment. With high-quality graphics and a sandbox type of gameplay where you can’t do much wrong, it should keep most smaller ones interested.